← Egg Salad – Secret Ingredient? I do like molasses cookies. I realize that molasses tends to be polarizing. You either love it or you hate it. I personally can’t say that I LOVE it, but I do like it and everyone once in a while, have a hankering for it. I had such a hankering the other day and I knew given my newfound whole foods, less refined foods lifestyle, that I would have to create my own recipe. I wanted to use whole grain and a healthy sweetener. I decided to try using sucanat, which is a non-refined sweetener that retains all of the vitamins, minerals and trace elements found in the natural sugar cane plant – it has a flavor closer to traditional brown sugar but a different texture. (for a closer brown sugar replacement, try muscovado sugar.) I used white whole wheat flour which is whole grain but not quite as gritty as whole wheat but not as finely ground as whole wheat pastry flour. I would say you could easily use the whole wheat pastry flour in this recipe but I didn’t have any on hand when I made these cookies. You could also use unbleached white flour but I have transitioned to whole grains and sprouted grains whenever possible so I get more “bang for my buck” when I eat grains. The best molasses to use is unsulphured molasses. Also, be sure to use butter not margarine. I know it is tempting to us margarine because it is cheaper but it is costly to your health. Oven should be set at 350 degrees. Prepare cookie sheets – line pans with parchment paper. In a bowl of an electric mixer, beat the butter until smooth. Add sucanet, molasses, egg, and egg white and mix slowly to incorporate. For a denser cookie, only use egg white. For a more cake-like cookie, use both egg and egg white. Slowly add dry ingredients mix and stir slowly until well blended; dough will seem thick. Roll dough into 3/4 to 1 inch balls. Place on cookie sheet. Bake for 8 minutes. Don’t overbake or they will be dry. The dough will be somewhat soft when removed from the oven. Allow to cool on sheet for one minute and move to a wire rack. 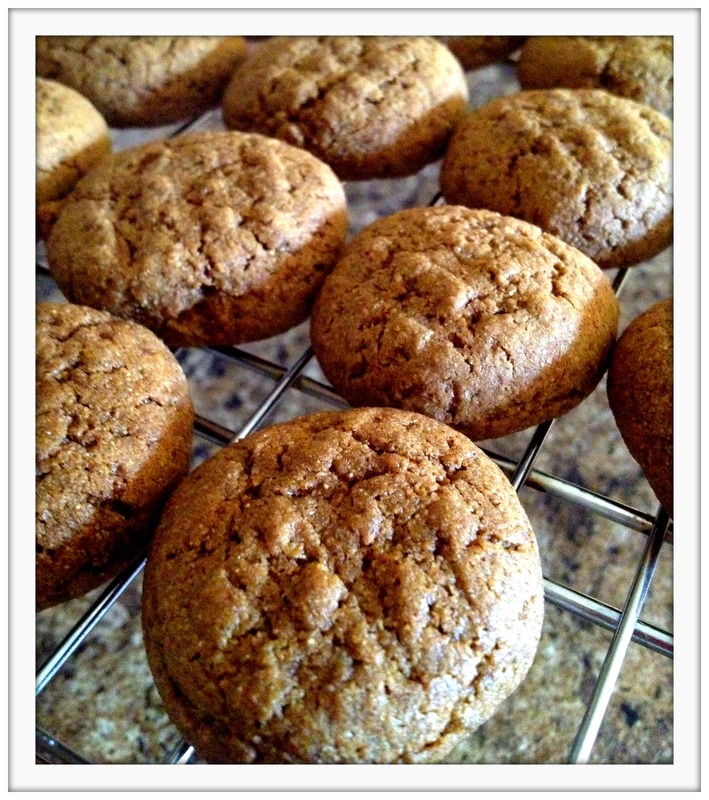 This entry was posted in Desserts and tagged cookies, molasses cookies, muscovado sugar, sucanat, whole wheat flour. Bookmark the permalink. Where do you get muscavado sugar? I can’t find it around here. I found it at my local Giant Foodstore and my local health food store has it as well. I has never heard of it until I saw it at Giant.